Bell Hiking Tail to Wet Beaver Creek: perfect "Splash Canyon." 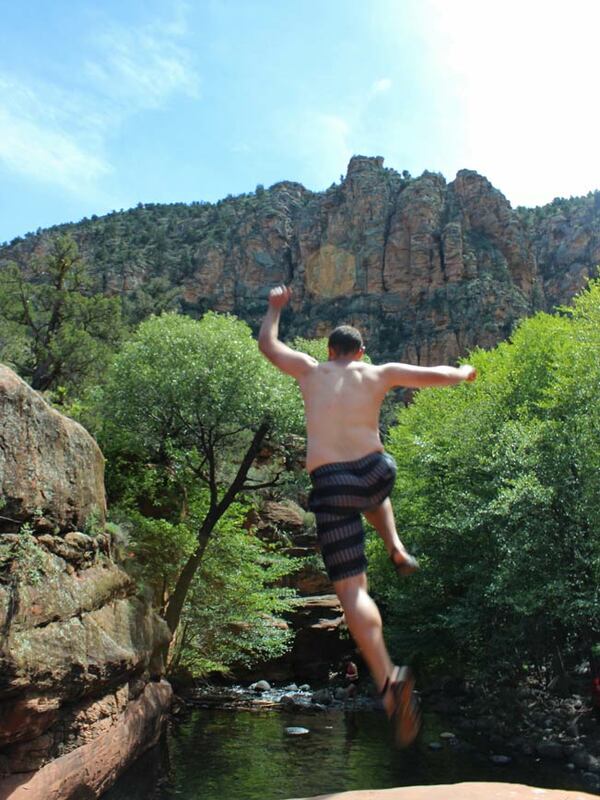 The irresistible “splash canyon,” (east of Sedona) on Bell Trail, makes for a perfect day hiking and doing cannonballs. 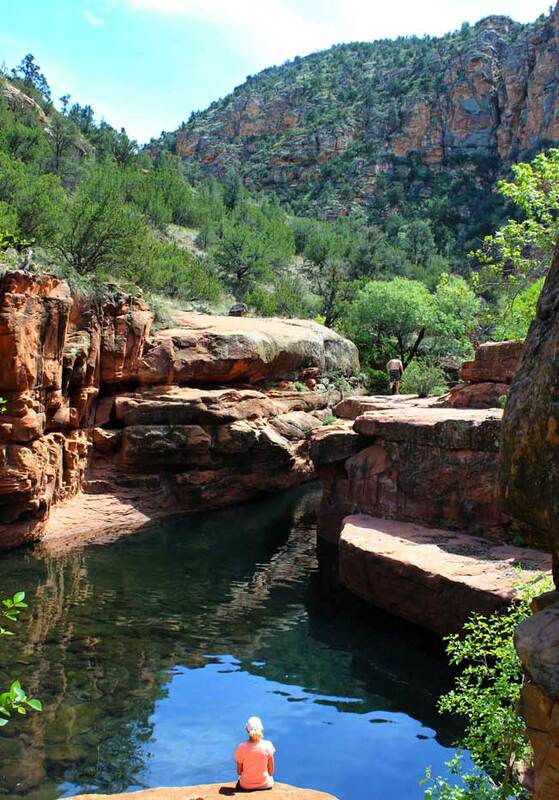 Located 3-miles along the trail and wedged between tall canyons, this crisp, crystal clear, swimming hole, beckons hikers to cool off, with leaps from its sandstone ledges into the translucent pools below. Jump in! Cool off! Your clothes will dry completely on the hike back along the lush, creek-fed valley. 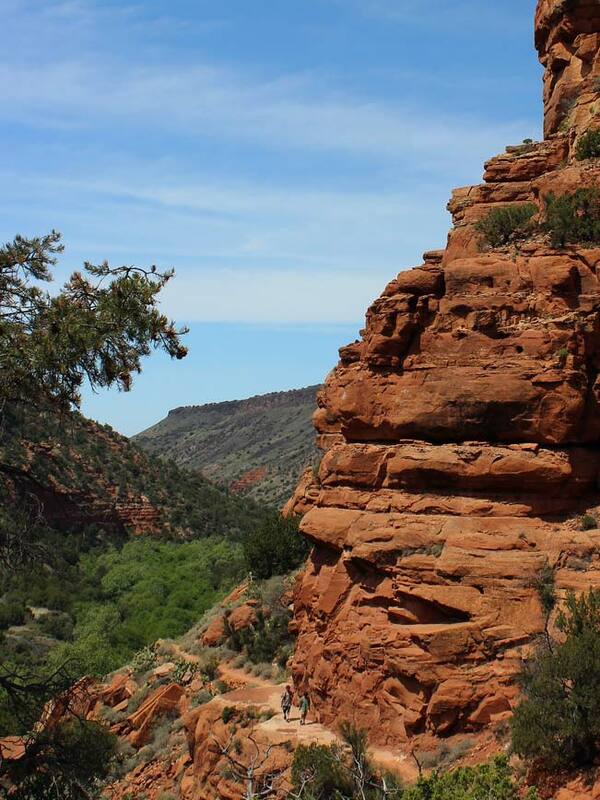 Hiking the easy three-mile section of Bell Trail, through Wet Beaver Creek Valley, it’s hard to imagine the 20′ high sandstone cliffs and pools of water waiting for fun up ahead, at Bell Crossing – also called the “Crack”. Glimpses of the shallow, babbling brook – through the lush Cottonwood Trees lining its banks – give little clue to the not-yet-visible “bottleneck” canyon that squeezes Wet Beaver Creek into a wondrously refreshing swim site three miles further in. The trail is mostly flat for two miles and then slowly ascends halfway up the side of the valley, along a sandstone wall, before opening onto an exceptionally splash-worthy swim hole. Here you’ll encounter sandstone cliffs and platforms, of various jumping heights, over crystal clear, numbingly cool, pools of water. The creek feeds into the canyon from one end and continues on its way down the valley on the other. Some revelers bring blow up inner tubes and float between canyon walls, while others make it a mission to do as many cannonballs as possible. Stay for lunch and a swim. And please be sure to bring out your trash! The Bell Trail continues for another 7.7 miles up the valley (that mileage is not included in the information above). For those who prefer not to hike, there are wonderful roadside swim spots, with good parking, about a half-mile past the trailhead, on I-79/FR618. Locals refer to this narrow canyon section, where Bell Trail crosses the creek and the water accumulates, as “The Crack”, and its protruding ledge as the “Tongue of the Beaver.” Bell Trail is the early 20th-century work of an eastern transplant cattle rancher, who blasted the canyon walls to create a shorter driving trail to and from the Mogollon Rim. Directions From the intersection I-17 and AZ-179 (I-17 exit 298) turn east on AZ-179/Forest Road 618 (away from Sedona) and continue approximately 1.5 miles to the Wet Beaver Creek Trailhead parking area, located on the left side of the road. My daughter and I found your post while searching for this hike! Great photos and info :). Yay! So glad you found us. Hope you had fun. This is such a great hike. Hi,is it possible to camp here? If so what’s the best deals around? Hi Daniel. Sadly, camping on Wet Beaver Creek is prohibited. There had been a campground on FR 618, just past the entrance to Bell Trail. However, the Forest Service converted it to a day use area, since it’s prone to flash flooding. The rangers that man that area often have recommendations for a couple of nearby campgrounds, but I am not familiar enough to share. 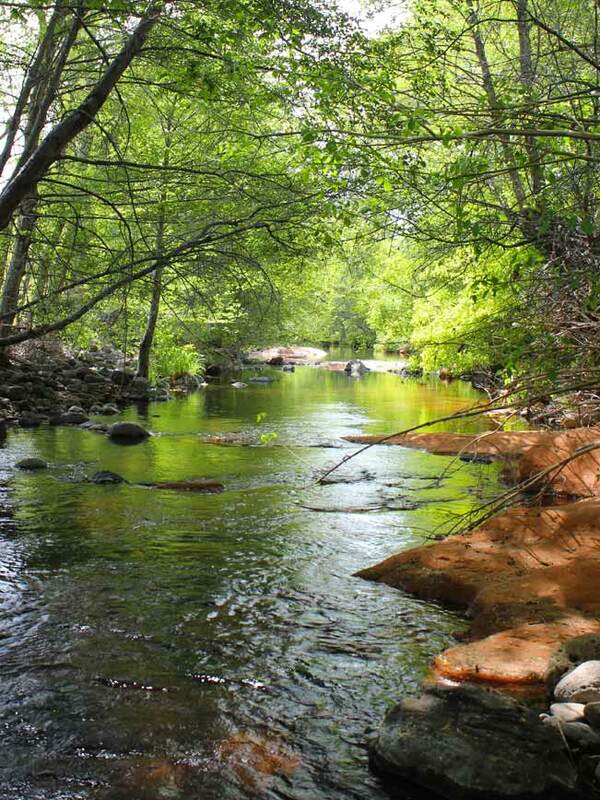 Another option might be the Manzanita Campground on Oak Creek in Sedona. I am a little confused, is the total hike six miles to get to the swimming hole or just three miles? Also, how would this hike be for kids? Hi Alyssa. It is a 3.3 mile hike to reach the swimming hole. If your kids are 8 or older, and comfortable with long walks, it should be doable. The trail is pretty exposed to the sun, so be sure to bring lots of water & sunblock, and head out early if possible. Have fun!